A mermaid falls in love with a man and forsakes her underwater life and immortality for the love she feels. Once on land though, there are consequences she must face, for life above is not like life below. Hester meets a stranger who guesses things about her she hasn't dared to speak aloud. In her family death and birth seem to be linked. The stranger urges her to explore her family's history and figure out why the women all seemed to be cursed. What starts out as small curiosity grows into something larger than Hester could imagine. Her love for the stranger grows and things seem to start trying to tear them apart. It's up to Hester to solve the mystery though and save her own life. This was a very interesting story. Quite a few parts were obvious to me though, so that made the novel easy to put down. I really liked how the mermaids were described though. There weren't Ariels singing about in their seashell bras. These ones were much more sinister, with sharp fins on their wrist and long, strong tails. I really loved the mermaid part of the story, and wish there was a bit more of that and a bit less land. Hester just seemed kind of dumb for not realizing the things that were right in front of her. Maybe if I was in her situation instead of seeing it from the outside, I would have done the same thing—not realized the same things. Alas though, I am a reader and it bothered me how clueless Hester was. I liked seeing all the pieces fit together and spelled out and it was an interesting plot. I just felt like I was sitting around waiting for Hester to catch up though. I would like to find a dapper man named Ezra by the sea though, that sounds fantastic. I wish Peter was in this book more. He seemed like a great guy too, but we rarely got to see him. Hester was a complete jerk to him all the time, which was kind of like kicking a puppy. Her was so hopelessly in love with her, and she just didn't care about his feelings. If Hester was a bit more empathetic and more intelligent, I think I would have liked this story a whole lot more. I'd love to hear your thoughts on it if you've read and loved it. It just wasn't for me. "And then he examined him under the lamplight: the young man's lips were blue-purple, his breath was shallow, and his skin was cool to the touch." Great review, hun! 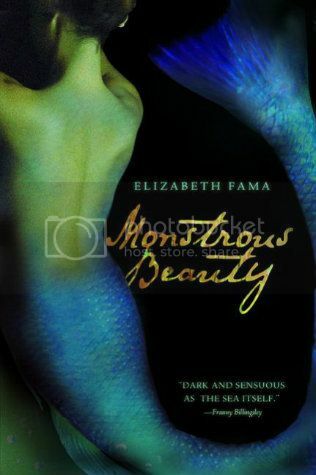 I've wondered about this book but I'm not a fan of mermaid books but these mermaids sounds different, darker. Clueless characters can be so frustrating sometimes.